When is it safe to remove URLs from a disavow file? Anything to do with links and disavows has been a hot topic ever since Google launched the new real time Penguin. Can disavows be removed with how Penguin discounts links now? Or should they be kept in place? The question came up on Twitter, and John Mueller tackled the question. @Andrew_Isidoro @methode If you've cleaned up the links & they've been reprocessed, you can remove those URLs from the disavow file. This response was rather surprising. Does this mean once Google has processed a disavow file that it no longer needs to be in the account? Does it mean that once a link is disavowed it can never be reavoed again? The specific wording raised a lot of questions. The big question was what exactly “cleaned up” means. While for some this could mean specifically that links are no longer on the site, but for others, cleaned up can refer to links that have either been removed OR disavowed. Mueller responded to me and clarified that he was referring to links that are no longer “live, unnatural, passing PR” – so if the links are still active and not nofollowed, you should still keep them in the disavow file. @jenstar @Andrew_Isidoro @methode If the links aren't there anymore (or nofollow), you don't need to disavow them. @jenstar @Andrew_Isidoro @methode If those links are still live, unnatural, passing PR, & you can't remove them: keep them in the disavow. He also repeated something that has been brought up multiple times since the new real time Penguin launched, that nothing has really changed with how site owners should be using the disavow file. @ShahMenz @jenstar @Andrew_Isidoro @methode Nothing really changed there. 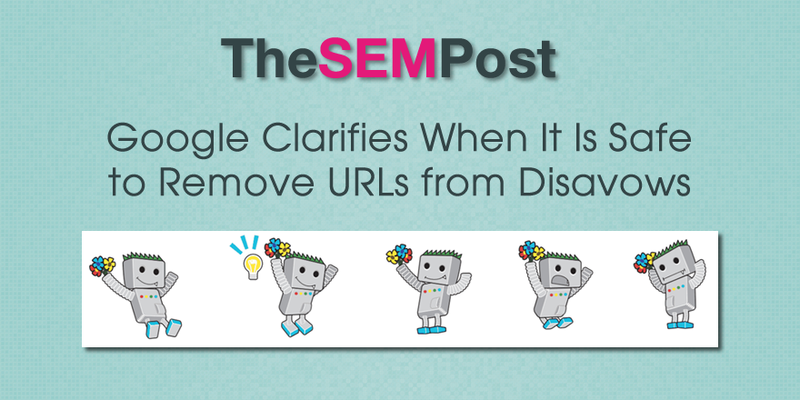 Also: no harm in keeping a removed link in the disavow file. There is also the question about whether disavows are still needed with the changes to Penguin. But Google has been upfront and says Google still uses links for other parts of their algo and bad links can still result in a link related manual action. So if you are tempted to remove a disavow file simply because of Penguin, proceed with caution.